An electric guitar is all about stage presence. Need to be cooler than a single guitar? No problem — there are double neck guitars. Need to be cooler than that? No problem, the guy from Cheap Trick has a five-neck guitar. Need to be cooler than that? Robbie Robertson played a guitar with an extra mandolin neck on The Last Waltz. Where do you go from there? Obviously, the solution is putting a TV in your guitar with a boatload of individually addressable LEDs in a guitar. That’s what [Englandsaurus] is doing, and the build thread is now getting into how to turn a bunch of LEDs into a display. In the first installment of this build thread, [Englandsaurus] went over the construction of the guitar itself and how a hundred individually addressable RGB LEDs were installed inside two pieces of plexiglass. When the guitar is displaying white at full brightness, the power draw is 500 W. This, in itself, is remarkable; no sane person would ever plug a guitar into a 500 W amp, and even 100 Watts is just too damn loud. There’s more power going to the lights here than the amplifier, and that’s awesome. Simply sticking LEDs in a guitar does not a build log make, so how are these pixels addressed? How do you make a display out of a bunch of LEDs? This is a hell of a problem, but with Artnet and Resolume Arena 6 these pixels can be mapped into a cartesian grid, and from there it’s just putting video on the guitar. While the first installment of this build is great and shows you how far you can take electronics in a guitar, this installment is a great demo of turning a bunch of LEDs into a display, something that applies to more than just a gigantic glowey guitar. Theatrical lighting usually runs with the help of DMX, a protocol that’s basically MIDI for lights; small, lightweight, ancient, and able to run on the lowest spec computers imaginable. For his Hackaday Prize entry, [Alex] figured a regular ‘ol graphing calculator was sufficient to run a complete DMX controller, and with the help of an Arduino, figured out a way to do it. The hardware for the system consists of a TI-84 graphing calculator, a few bits and bobs in the way of components, and an Arduino Pro Mini powered from the USB port on the calculator. The Arduino handles the transmitting of DMX packets at 250 kbaud using the DMXSimple library over a 5-pin XLR jack. The software running on the calculator is where the novel part of the project begins. The software is designed to be extremely lightweight, sending packets to the Arduino using the 2-wire link cable. DMX Commands are wrapped up and transferred using the TI-83/84 link protocol, decoded on the Arduino, and sent out to the lighting rig. While this probably won’t replace the multi-thousand dollar lighting consoles found in theatres, it’s still a very handy and portable tool for debugging lights. It’s also [Alex]’s My First Electronics Project™, and a pretty good one at that. Despite being around for about as long as MIDI, DMX, the industry standard for controlling stage lighting and smoke machines, is still an astonishing expensive protocol to work with. Where MIDI can be banged out with a simple microcontroller – with odd bit rate requirements, no less, DMX testers cost hundreds of dollars. Of course this means the market is wide open for a DIY DMX tester, and over on the projects site [Tony] has just the thing. For the hardware, [Tony] is using few 4×4 matrix keypads for user input, and a character LCD for the display. With this, he can set any of the 512 lighting channels in a DMX setup to any one of the 256 intensity values. Setting a range of channels to any intensity is a snap, with an extremely cut down command protocol. 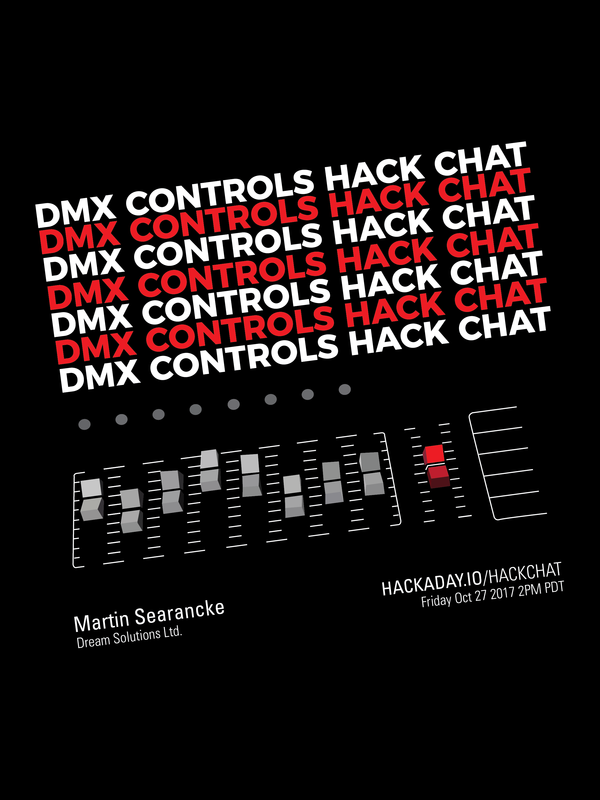 All the processing is handled by an Arduino, which seems more than capable of handling the DMX protocol thanks to the Conceptionetics DMX library. While it’s not a full-blown lighting console you’d find in the back of a theatre, it’s more than sufficient to test a lighting rig. It also seems pretty simple to use, just the thing if you’re trying to wrap your brain around some theatrical lighting. When [Robert] is presented with a challenge, he doesn’t back down. His friend dreamed of reusing some old LED panels by mounting them to the ceiling of the friend’s night club. Each panel consists of a grid of five by five red, green, and blue LEDs for a total of 75 LEDs per panel. It sounded like a relatively simple task but there were a few caveats. First, the controller box that came with the panels could only handle 16 panels and the friend wanted to control 24 of them. Second, the only input device for the controller was an infrared remote. The friend wanted an easy way for DJ’s to control the color of the panels and the infrared remote was not going to cut it. Oh yea, he also gave [Robert] just three weeks to make this happen. [Robert] started out by building a circuit that could be duplicated to control each panel. The brain of this circuit is an ATtiny2313. For communication between panels, [Robert] chose to go with the DMX protocol. This was a good choice considering DMX is commonly used to control stage lighting effects. The SN75176 IC was chosen to handle this communication. In his haste to get this PCB manufactured [Robert] failed to realize that the LED panels were designed common cathode, as opposed to his 25 shiny new PCB’s which were designed to work with a common anode design. To remedy this, he switched out all of the n-channel MOSFET with p-channel MOSFET. He also spent a couple of hours manually cutting through traces and rewiring the board. After all of this, he discovered yet another problem. The LED’s were being powered from the same 5V source as the microcontroller. This lead to power supply issues resulting in the ATtiny constantly resetting. The solution was to add some capacitors. Click past the break for more on [Robert’s] LED panels.